The Estacada Public Library is facilitating several opportunities to learn a new language. Library staff will host a Spanish conversation group and a bilingual children's storytime in English and Spanish through June. The conversation group meets from 1-2 p.m. the third Saturday of each month, and the story times will be held from 1-1:45 p.m. the first Saturday of each month. The conversation group will meet next on April 20, and story time is scheduled for April 6. The conversation group, previously known as language exchange, was established at the library last year. They met during the summer and fall, but took the winter months off. The group is open to all ages and focuses on conversational elements of Spanish. "There's a focus on everyday experiences and conversation skills," said Alice Perez Ververa, a member of the library's staff who facilitates the group. She noted that each meeting has a theme, and the last one focused on food. The bilingual story time includes stories and songs in Spanish and English. Additionally, there are sometimes crafts and snacks. There is an emphasis on vocabulary, and words from both languages are spoken as well as written. "There's the visual so they can see it and learn to spell," she said. "They can listen to the language and see how it's written. We learn through different senses." Perez Ververa noted that both events are valuable opportunities for those who wish to learn new skills or build upon ones they already have. "For language learners, it's a good opportunity to work with other learners who would like to practice with someone," she said. "Building community through language is a nice thing to see." 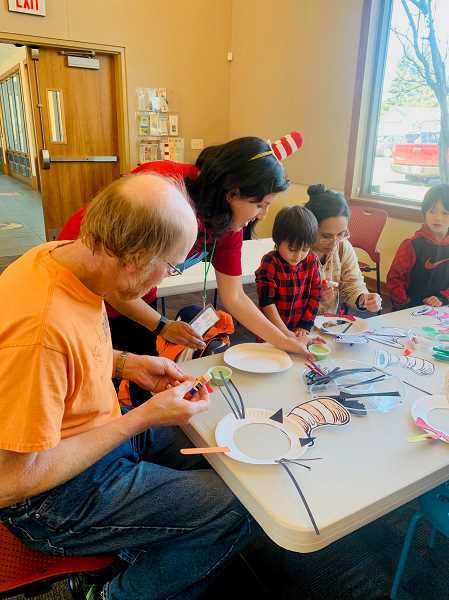 The Estacada Public Library's Spanish conversation group meets from 1-2 p.m. the third Saturday of each month, and the bilingual children's storytime is held from 1-1:45 p.m. the first Saturday of each month. Both events are at 825 N.W. Wade St.